If you relied solely on random reviews of Ivoire on the Internet, you might believe that this early '80s perfume merely screams "old lady" and "soapy" and call it a day. That would be a pity, because you'd miss out on the scent experience equivalent of going to a Sherwin Williams paint shop and realizing, after an hour or so of comparing paint chips, that the shades in between stark white and cream can be staggering and infinitesimal. Ivoire is an olfactory meditation on how a clean fragrance can have depth and texture, and how its individual notes can reverberate and resonate with one another to signify "clean" and "fresh" in a complex, even sensual, way. By evoking the tusk of an elephant or the keys of a piano, the name Ivoire asks us to think about the richness of white — its "off-whiteness" — rather than its purity. Upon first whiff, Ivoire, (a green floral according to the H&R fragrance guide, to which I would add chypre) gives us the whitest paint chip on the olfactory color wheel: fresh, bright and citrusy top notes, further lifted by aldheydes. This first impression is a white of the flash-bulb blinding variety. This is only for a second, as the aldehydes die down and the piquancy of galbanum provides a wonderful first variation on clean — the resiny, piney, vegetal version, backed up by a hint of lemon and bergamot. Ivoire then moves subtly and almost seamlessly to its floral heart with spicy carnation flanking the soapy-clean beauty of rose, jasmine and lily of the valley. 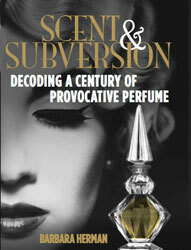 A Basenotes reader commented that this is not an easy perfume to describe. I wonder if she meant that because of the skillful way the notes marry one another, shifting subtly from one note to the next, so that it's hard to tell where one note starts and the next begins. Where Ivoire gets interesting for me is in the dry-down. The sandalwood, cedar and oakmoss create an incensey and woody finish, while the amber, musk and orris soften and blur what might feel, initially, like their harshness (like the burn you get when lighting incense followed by its mellow diffusion). A whisper of the warmth from these notes — the sweetness of amber, the animalic dirtiness from musk, the creaminess of orris — move you subtly from that white paint chip to the cream one. Or you could say they move your eye from the smoothness of the ivory tusk to a nick filled in with dirt that creates an interesting texture on the pristine surface. Like a Mark Rothko painting meditating on white, Ivoire's notes hum and vibrate in unison, from the aldehydes and galbanum top notes, to the rose and lily heart, to the amber and sandalwood base. It's more than (initially) meets the nose. I picked this up at T.J Maxx on sale. I think it's lovely. To me it's calm and sophisticated. "Or you could say they move your eye from the smoothness of the ivory tusk to a nick filled in with dirt that creates an interesting texture on the pristine surface." Or I could say I love your writing. Calm is a perfect descriptor, Mary. Thanks for stopping by and for the compliment. ;) Hope you continue to come back. I get chypre here too quite a bit. Every review on Ivoire uses the word "soapy" and I find "woody chypre" to be a much better descriptor. Ivoire really is stunning. The drydown smells just like an old 70s perfume from Jovan called Ginseng, which is impossible to find nowadays and very expensive. Who needs to track down Ginseng when Ivoire's drydown smells identical if not better. Love it! Smooth and pristine- my adjectives for this one! I am sad to admit this but in high school I babysat for an affluent family whose matriarch had this one in the bathroom (yet I never smelled it on her). One day I came to work with a small empty bottle which I filled up with her Ivoire EDT splash! Shame on me! Please can anyone tell me what perfume today,if any, is reminiscent of Ivoire? I dont think perfume has a gender, so really I think men can wear anything. Is Ivoire conventionally masculine? No. But it is green, clean, a bit soapy. I say go for it. I must find Kalista, by Eric Dorian, Paris. And two years later I comment again. That transgression I mentioned above inspired a perfume post! I am sniffing the vintage Ivoire on my wrist right now and it is absolutely divine...so creamy...decadent...love it! How fortuitous that I have procured a large vintage decant, thanks to a fragrant obsessed friend who mailed it to me from Japan! Ivore is one of my favorites. I find it intoxicatingly feminine. Just a dab of perfume and I'm drifting. I hope other find it so. Roz, I love Ivoire! Sounds like you do, too.